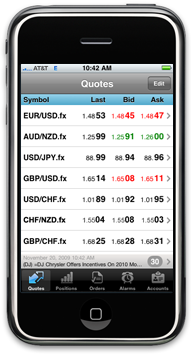 Many people asked MetaQuotes to develop a mobile version of Metatrader 4 for Iphone. Unfortunately, the mobile version of MT4 is only available for the Windows Mobile platform ( Smartphones and Pocket PC's, look for the download links in "MT downloads" sidebar ). 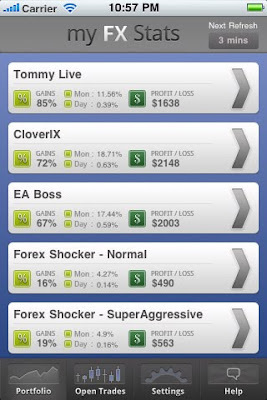 However the good news is that Metatrader 5 will be available for Iphone and Google Android platforms! It was recently confirmed by MetaQuotes staff in this thread. The development of the Iphone app is progressing, and it will be probably released first. Bad news is that there wont be a version anymore for the Windows Mobile platfrom, Windows Phone 7 will be also avoided. I think this is because of the bad reputation Microsoft got with the countless bugs of Windows Mobile 6 and the drastic changes in code in the 7th version. 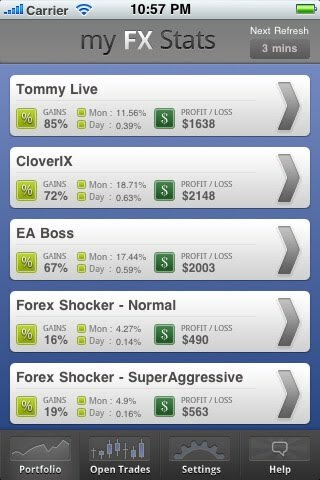 The Metatrader 5 Iphone app will feature a uniform design that will seamlessly fit in the Iphone interface. The app is developed from scratch and will be 100% native to the Iphone OS. Also, it will be different from the interface in Metatrader 4 Windows Mobile. The release date is not known yet. If the mobile version of Metatrader 5 is one of the reasons you will buy a smartphone, this information will help you to decide what platform to buy. I personally like the Android OS. Actually, the remote connection to the desktop version of the Metatrader terminal is in some cases better than a mobile version of MT for the smartphone. On the smartphone you have always limited computing resources and not all features of the full version of Metatrader. For example, if you are using a expert advisor on your desktop, you can only control it via a remote connection. But if you want to quickly check the market quotes, the mobile version is better.